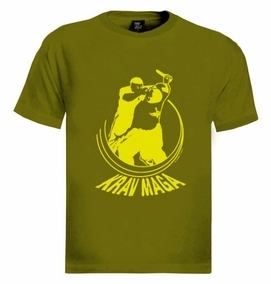 Knife defense combined with face attack on this Krav Maga T-shirt. Krav Maga (Hebrew "contact combat") is a self-defense and military hand to hand combat system developed in Israel. It came to prominence following its adoption by various Israeli Security Forces and is now used by military and law enforcement all over the world. Our t-shirts are made of 100% cotton and are long lasting with bright colors. Our products are all designed and printed in Israel.